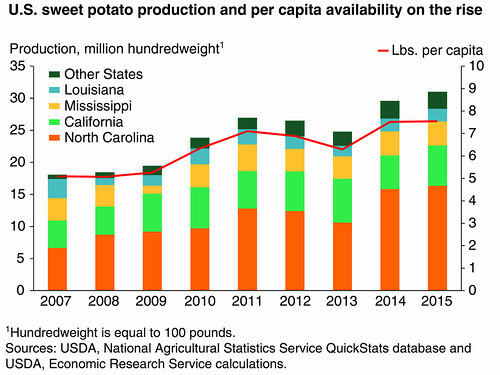 Since 2000, per capita consumption has risen as consumers increasingly enjoy sweet potatoes beyond the holiday table. New crop production hit a slight snag in early October of 2016, when Hurricane Matthew arrived in North Carolina. The storm brought record flooding to many areas of the State, which is the largest U.S. producer of sweet potatoes. Although some loss was inevitable, greater damage was avoided with much of the crop having already been harvested when the hurricane hit. To find out more, follow market analysis and outlook on vegetables and other commodities on the ERS website. 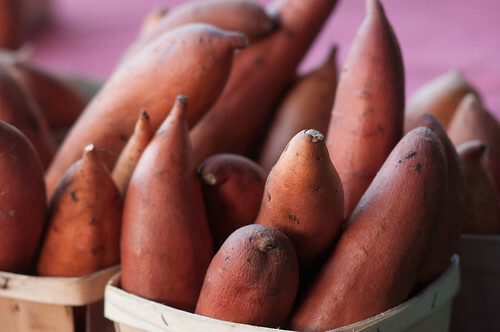 Consumers are finding new ways to enjoy this tasty tuber-the sweet potato.